is it possible to set a numerical value for the aspect ratio of a projector's input? I occasionally have a little bit of trouble avoiding image distortion when working with nonstandard screen ratios. Is there a way to numerically set the aspect ratio of the input to avoid this? Scaler actor + Crop actor + FFGLPanSpinZoom might be your friends on this one. I'm not sure what you mean by "an input", could you elaborate a bit more? An input of what? 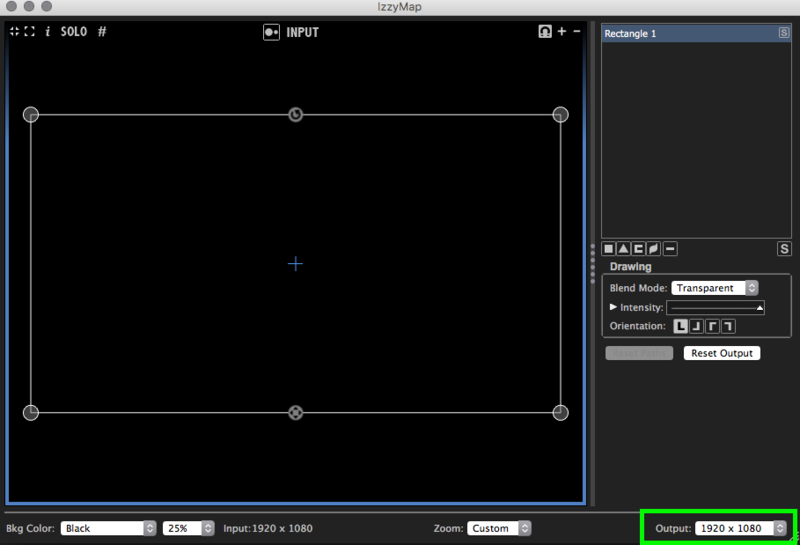 I usually try to make all of my source content the same resolution as in the preferences of the Izzy file, and then - if i need to use different projectors i use Izzymap to tweak the ratio. I understand things better with pictures than I do with written/verbal descriptions, so just for other folks like me, here's pictures of what @dbini was talking about. Nice reply! But it got me thinking about what should these numbers be if one is using a TH2Go? Should the prefs be set to the 1/3 division of the TH2Go? And in Izzy Map, output should be the total TH2Go or the 1/3 ratio? Should the prefs be set to the 1/3 division of the TH2Go? And in Izzy Map, output should be the total TH2Go or the 1/3 ratio? The new features in Isadora 3 are quite handy for demonstrating this. PS: I think I did the math right, but please anyone feel free to correct me if I'm wrong. In Isadora 2, using the Chopper actors to split one 5760x1080 image across three 1920x1080 Stages, with NO overlap, you need to cut it into thirds. All the Chopper actors have "horz size" 33.33 and "vert size" 100 to make them chop the 5760x1080 image into three 1920x1080 pieces. In Isadora 2, using the Chopper actors to split one 4992x1080 image across three 1920x1080 Stages, with 20% overlap, you need to cut it into thirds and account for the 20% overlap. Originally, with no overlap, all the Chopper actors have "horz size" 33.33 and "vert size" 100 to make them chop the 5760x1080 image into three 1920x1080 pieces. To account for the 20% overlap, we need to increase the "horz size" by 20%. 20% of 33.33 is roughly 6.66, so for the overlap all the Chopper actors need to be set to 39.99 for "horz size"